It seems I haven’t been watching enough Saturday morning television. If I had, I would not just now be learning about The Henry Ford’s Innovation Nation, with Mo Rocca. Innovation Nation is billed as “a weekly celebration of the inventor’s spirit,” and is full of fascinating stories. Fortunately for all of us, the stories are available online, any time we want to hear them. It is easy to log into the online list of episodes, and choose one that interests you. For example, one of my favorites, Episode 2, dealt with José Gomez-Marquez, a “Medical MacGyver” who makes lifesaving medical devices from toys. In less developed parts of the world, one of the challenges of medical advances is that many of them depend on advanced technology is expensive and is difficult or impossible to repair far from the factory. 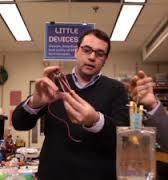 Gomez-Marquez, of MIT’s Little Devices Lab, hacks toys to create low-cost medical devices. If you’d like to see some of his work, click on the “Watch Full Episode” link found under the preview of Episode 2. Later parts of the same 20-minute episode deal with moving trains on a turntable, shopping carts of the future, and lights made from soft drink bottles. Innovation Nation is a great way to inspire inventors young and old to look at both the problems and the inventions around them in new ways. It is only part of The Henry Ford Museum’s collection of materials to support innovation. You can download lessons on the nature of innovation and view an amazing collection of interviews with innovators. More on that next time. For now, grab your favorite treats and settle in by your computer for some innovative viewing. You—and your students—can’t help but be inspired. PS Like many of you, seeing just five minutes on toy hacks for medical devices made me anxious to see more. So, just for fun, here are three more minutes of inspiration! « Who You Gotta Meet?